There are many wonders that modern technology has given us. We have the world at our fingertips, and an easy way to travel. But in the South, and especially here in Florida, there's one modern miracle that makes life so much easier this time of year, air conditioning. A/C makes summertime in Florida livable. Unfortunately the air quality inside most of our homes is pretty horrible. We use chemicals in everything, and all of those chemicals effect our air quality. Since we are spending so much more time inside to beat the heat, what can we do to clean our air and make life a little more pleasant? Plants! 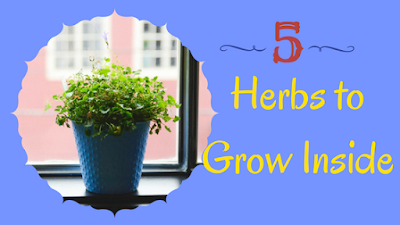 Bring the herb garden inside! 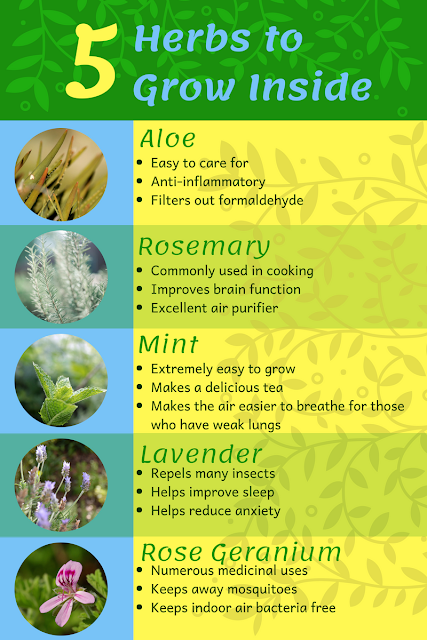 That way you have easy access to herbs you love to use, and they help to filter your air. Here's a list of 5 of my favorite herbs to grow inside and why they're so awesome! Aloe is a plant that I use almost every day. I make quite a few hair and skin products using aloe gel, I use the whole leaf to reduce inflammation, and I even drink aloe water. It has a number of amazing health properties and I could go on and on and on. In fact, one of my first posts on this page was all about aloe. It's easy to take care of as long as you keep it well drained and it helps to filter out formaldehyde, which is commonly found in carpets, rugs, and furniture. Rosemary might be a little tricky to grow inside, especially if you're new to gardening (this page has some great tips). However, it's well worth the effort. Not only does it help to purify the air, but it releases essential oils from it's leaves. These oils actually improve cognitive function. They help improve memory, protect the brain from free radicals, and they help keep your house smelling great. Plus, whenever you need some rosemary for that special recipe, it's just a few feet away! Mint is another herb I tend to use a lot. It helps improve the flavor of quite a few teas, tastes great in salad, improves digestion, and smells great. However, when you plant it, it will take over EVERYTHING. So I always make sure it's in a container, inside or outside, and I never plant it with other plants. I used to have a decent sized container that had 7 different varieties of mint, from pineapple mint to chocolate mint. However, the chocolate mint slowly took over and now I just have a large container of that. Lessons learned. But it's still a great plant to grow inside. It works well to filter air, but it also makes the air easier to breathe for those with weak lungs. Lavender is one of my favorite plants to grow indoors. It keeps the house smelling fresh and clean, repels insects, helps reduce anxiety, improves sleep, and is one of my favorite scents. However there are a few people who are allergic, and if you have cats make sure to keep it in a place your kitty won't get to. Cat's livers cannot process the lavender very well and may not cause immediate reactions, but over time the build up can cause liver damage. However, keep in mind that lavender LOVES sunlight and well drained, not very rich, soil. Windowsills are a great place for lavender to go. There are over 200 different species of geranium, and they are all great air purifiers and easy to care for. I prefer to grow Rose Geranium, however, because it's also a great tea for diabetics, it lowers blood glucose levels fairly quickly. All geraniums also repel insects and can survive without water for up to 2 weeks. Rose Geranium also smells very similar to roses, so it's a great way to get a beautiful, floral scent in your home without having to resort to chemical heavy scents. The more sunlight it has, the more it blooms, the more fragrance you'll notice. It also helps filter out, not just chemicals, but also bacteria from the air. So if your family is prone to infections, invest in some Rose Geranium plants. Do you find the rose geranium in the neighborhood Lowes or Home Depot? Or is in in a speciality floral shop? Sorry this reply took so long. I wouldn't bet on finding a Rose Geranium at Lowes or Home Depot on a regular basis. There are a lot of other garden shops that sell plants in Central Florida. One of my favorites is Lukas Nursery (lukasnursery.com), they also have a really awesome Butterfly encounter.